Botswana is a country of seemingly endless open spaces. Though it occupies an area the size of France, the human population is only 1.6 million. This is one country where wildlife does not face stiff competition for land resources from man. As a result the animals have multiplied with a flourish. Botswana can justifiably claim to host some of the finest game sanctuaries in Africa. The worlds' largest exporter of diamonds by value, the country is not under pressure to get in more tourists. And the government has adopted a deliberate policy of keeping visitor numbers low. The hidden hand of the market has responded by adjusting the price to reflect this reality. 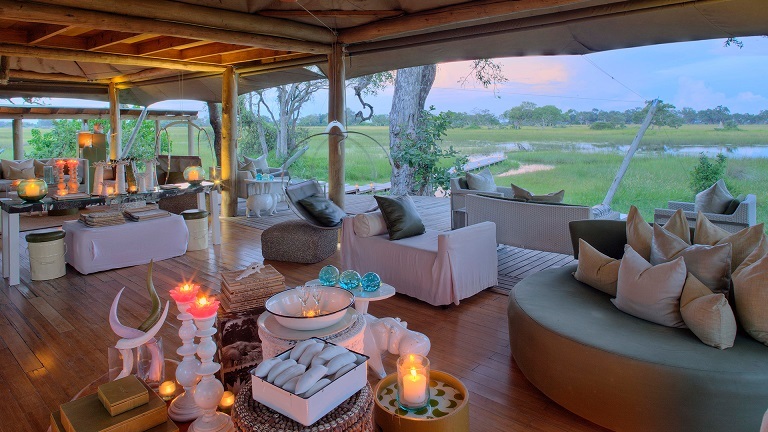 Botswana has therefore emerged as an exclusive up market safari destination. Bill Clinton, together with his wife went on safari in Botswana in 1998. The power couple was greatly fascinated by the wildlife, and the serious games of life and death they play. Affirming his position on top of the food chain, the president ate for dinner some of the animal species he had watched earlier. His evening buffet included zebra, crocodile, impala in monkey sauce, and giraffe. 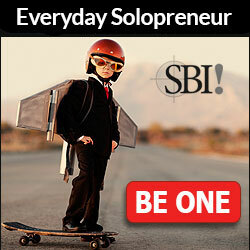 "I tried it all", he declared with satisfaction. But the former American president is only one in a long line of heavy hitters to enjoy the wildlife havens of Botswana. Hollywood legends, Richard Burton and Elizabeth Taylor chose to remarry here, for example. Botswana is dominated by the Kalahari Desert. It occupies 84% of the land area, mostly in the west, central and north of the country. But the Kalahari is not a desert in the Sahara sense. You find the occasional sand dune, but also substantial vegetation in the form of short thorn and scrub bush, trees and grasslands. Very little water though, and hence the desert tag. 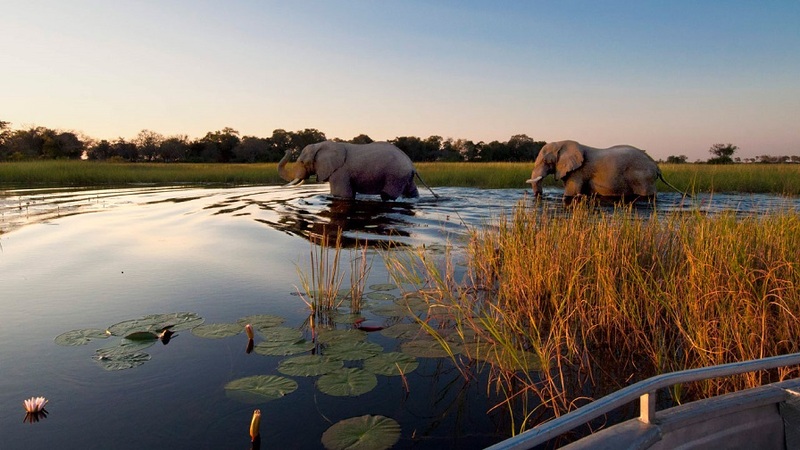 To the northwest, you find Okavango, the world's largest inland delta. The northeast is a land of gently rolling tablelands interrupted by granite hills and rock formations. The east and southeast, where 80% of the people live has more varied relief. And the rain clouds linger more and unburden themselves more freely, relative to the rest of the country. Today Botswana is a peaceful, well-managed and relatively prosperous country. The country wealth per man indicator places among middle-income nations alongside Mexico and Russia and ahead of Brazil. But it has not always been so and the country has come along way. The San people (otherwise known bushmen) are believed to be the original inhabitants of Botswana. Their descendants survive to this day, some living as their forefathers did for most of the 30,000 years historians guess they have been around. Later -much later, Bantu groups, prominent of which were the Tswana, became the masters of these realms. The modern Botswana nation has been shaped by the alliances made in response to historical currents swirling in southern Africa in the eighteenth century. The rulers at the time aligned their interests with those of the British against the Boers who were approaching from the south and the Germans from the west. For the British, the value of the alliance was strategic and not much was expected in terms of economic advantage. And that is how the relationship resulted in the Bechuanaland Protectorate - the precursor of modern Botswana. The British remained in charge until independence in 1966. The visitor to Botswana is drawn by the credible intelligence that abounds about the quality of its pristine wildlife sanctuaries. 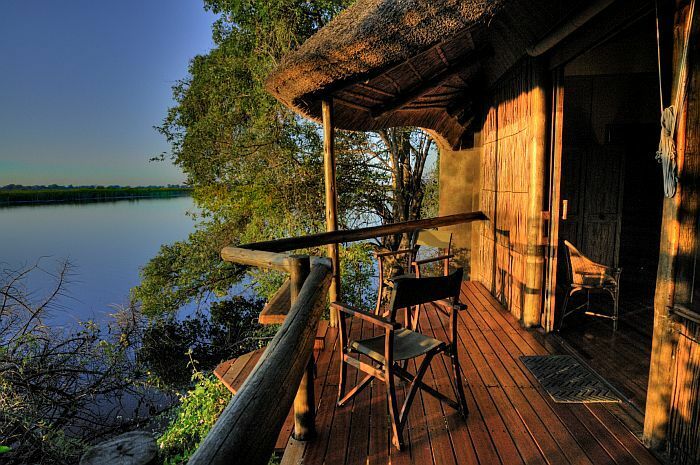 Chobe National Park, one of the finest game parks in Africa is located to the north east of the country. The park has the greatest variety of game anywhere in the country. That is why the busy Bill Clinton found himself at Chobe for his short safari. Wildlife thrives among the swamps and grasslands that stretch along the flood plains of the Chobe River. Occupying 10,560 square kilometers, it is particularly renowned for the great concentration and sheer abundance of its elephants, estimated to number 80,000. The Chobe elephants are migratory and move along the Chobe River, their reliable redoubt in the dry season. African elephants are the largest among elephant species -and those at Chobe are the largest of them all. The population has gradually built up since the 1930's when wildlife in the area began to enjoy some sort of protection. The infamous trade in ivory, particularly in the 1970's and 80's encouraged the decimation of elephant populations in other parts of Africa. But the elephants of Chobe - thank God - were spared contact with the dirty hands of poachers. Other animals to see here include some of the usual suspects on an African safari - lion, cheetah, hippo buffalo, giraffe, antelope, jackal, warthog, hyena, crocodile, zebra. The birdlife is also diverse. Cruising or driving along the Chobe River, you get the best view of the animals. 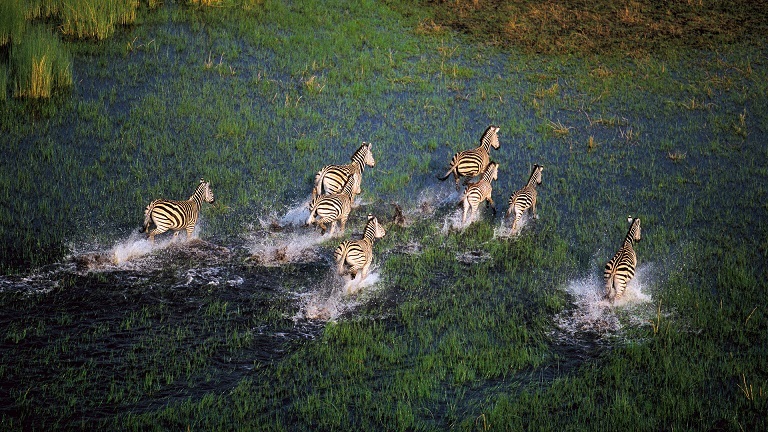 The Savuti Marshes of Chobe are reputed to have the largest predator population density in southern Africa. The marshes have the textbook features that draw predators. In a flat and hostile environment, they provide a place where wildebeest, buffalo, zebra and many species of antelope congregate for a drink. The predators - cheetahs, leopards, lions, wild dogs, hyenas, wild dogs, and jackals - naturally follow. Some predators such as lion tend to be rather lazy and the setting here is a gift. 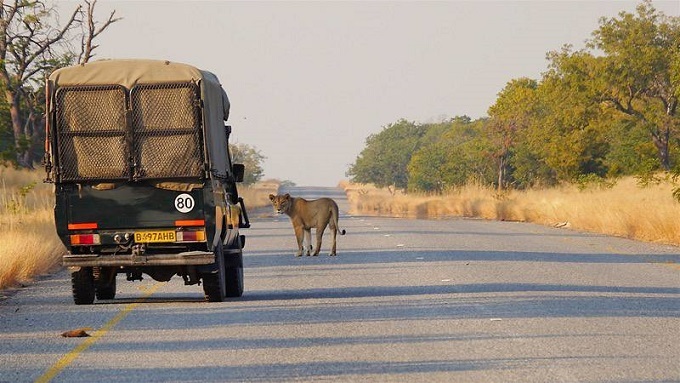 The usual entry point for Chobe is Kasane, which is located about 800km north of Gaborone. 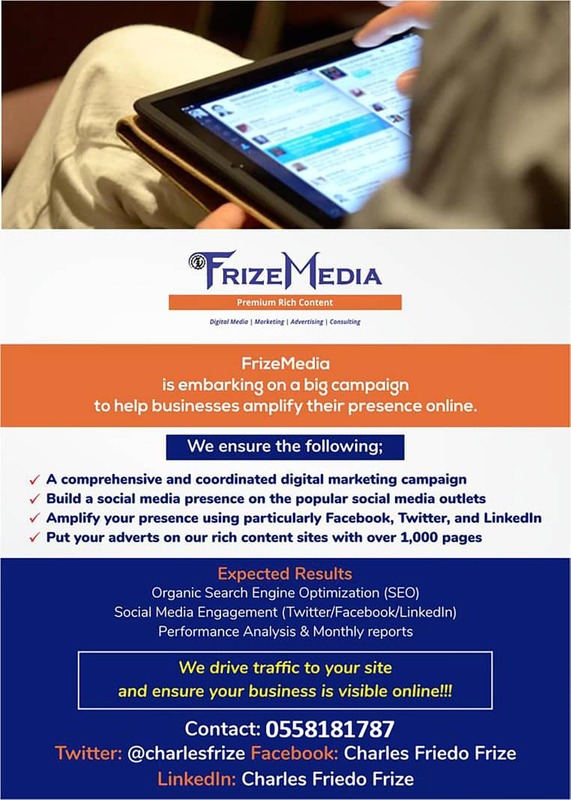 You get here by flying from Gaborone, Maun or Victoria Falls in neighbouring Zimbabwe. Camps and lodges can be found throughout the park. 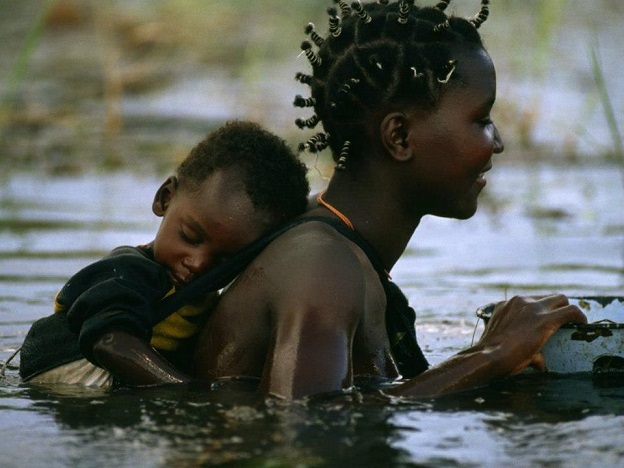 The Okavango Delta, in the north west of Botswana is the largest inland delta in the world. Spreading over 15,000 square kilometers, it is formed as the flow of the Okavango River slows down and soaks into the sands. That is why it is referred to as 'the river which never finds the sea'. The network of channels, ox bow lakes, lagoons, swamps and islands that arise is very pleasing to the eye. But that is not all of Okavangos' bounty. The delta is filled with wildlife - wildebeest, giraffe, hippo, elephant, zebra and buffalo have all found a home here. The birds too are plenty, more than 550 types, some of which live on the trees and others on the water. 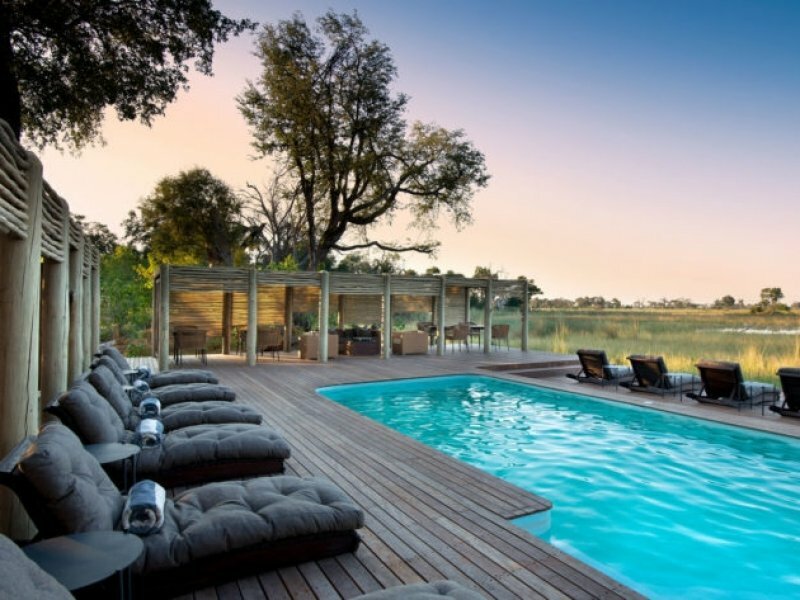 The best place to see wildlife in Okavango is within the spectacular Moremi Wildlife Reserve. The reserve lies in the centre of the delta and occupies 3,000 square kilometres. 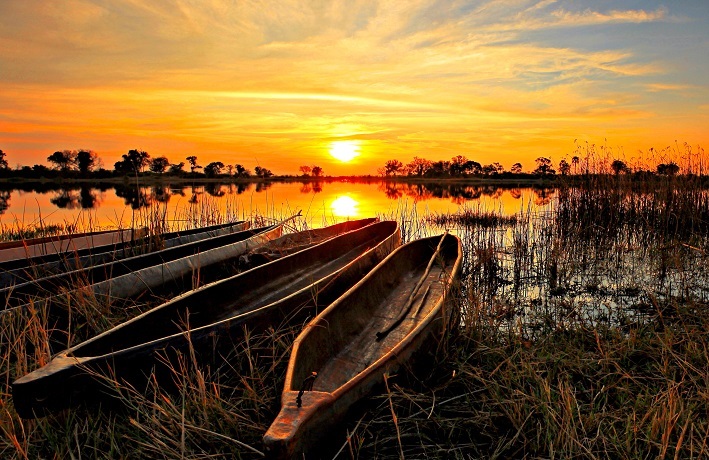 In Moremi you view game aboard a vehicle or by gliding on a makoro (dugout canoe) or other type of canoe. Accommodation is available in camps and lodges within the delta area. 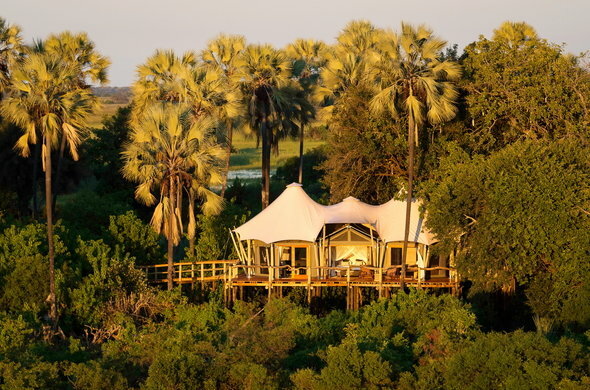 In Moremi itself, you can stay in tented campsites but no permanent camps or lodges are allowed. If you are interested culture, take a break at Chief's Island, the largest in the delta, and see ancient rock paintings. The painting were presumably executed by the artistically inclined fore bearers on the San people. The Okavango Delta should be avoided in summer, especially December to March, when most of the camps are closed down. At that time, it is very hot and humid- temperatures rise above 38°C, and thunderstorms unleash daily. You enter Okavango through Maun - the deltas' principal town, by flying or taking a bus from Gaborone, 600 km away. Visitors to either Chobe or Okavango may wish to add on a visit to Victoria Falls. 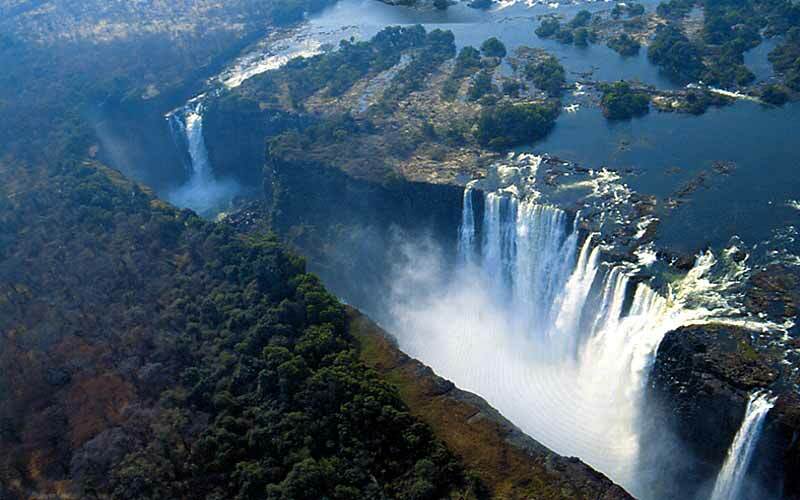 Victoria Falls is actually in Zimbabwe but is easily accessible from the northern part of Botswana. 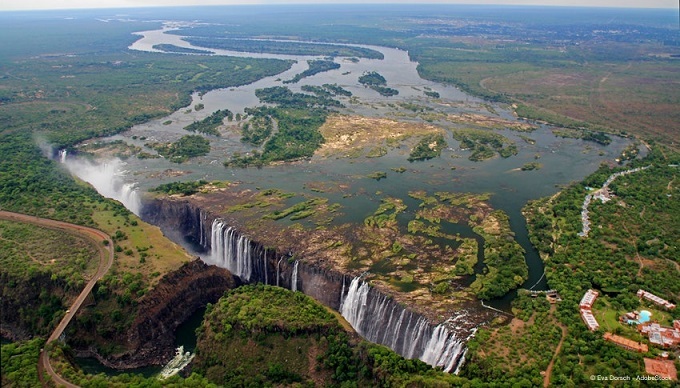 Victoria Falls is one of the most spectacular waterfalls in the world and one of Africa's prime attractions. Situated on the border of Zimbabwe and Zambia, the falls occur where the steadily flowing Zambezi River, without warning, casually approaches and then suddenly plunges down a series of basalt gorges in a breathtaking display of several waterfalls. Mist and thunder emanating from the falls can be witnessed from far off. The spray from the falls sustains the rain forest on the opposite wall of basalt and creates an almost constant rainbow visible even by the light of the moon. The falls are best seen from the air, thus activities such as helicopter flights, balloon rides and micro-lighting over the falls are a must do. Other exciting activities available are bungee jumping off the bridge - which also gives a spectacular view down the gorge, canoeing, white water rafting, river safaris, elephant back safaris and many more. Adventure seekers, who travel not merely to convenient places, may wish to check out the Makgadikgadi Salt Pans. The shallow saltpans cover about 6,500 square kilometres and rank among the largest in the world. The atmosphere here is admittedly surreal, with shimmering mirages in a vast open terrain broken only by a few baobab trees. Bird watchers in particular will be intrigued at the unusual environment as they watch numerous flamingos and pelicans. The pans occupy the area between Francistown (410 km north east of Gaborone) and the Okavango Delta. There is plenty of wildlife, in the Makgadikgadi National Park, but not as much as Chobe- so this will not be your only reason for coming here. Botswana is the site of a unique wildlife conservation initiative in Southern Africa- the concept of cross border parks. The initiative is anchored on the common sense observation that wildlife does not recognise international borders. Successful conservation efforts in an area bordering another country can be reduced to naught if the neighbouring countries do not collaborate. The Kgalagadi Transfrontier Park is a combination of two parks -the former Gemsbok National Park in Botswana and Kalahari Gemsbok National Park in South Africa. Covering over 36,000 sq km, Kgalagadi is one of the biggest wildlife conservation areas anywhere in the world. Botswana contributes about 75% of the park in the southern Kalahari Desert. The park is a unique conservation area for it allows the large-scale wildlife migratory movements that were once common in the savanna grasslands of Africa, but are sadly not possible any more. The appeal of the harsh beauty of the Kalahari aside, scientists are extremely curious to find out the secret story of the flora and fauna that has adapted to what appears to be a very difficult environment. For ordinary folks, the park is host to the famous black-maned Kalahari lions. 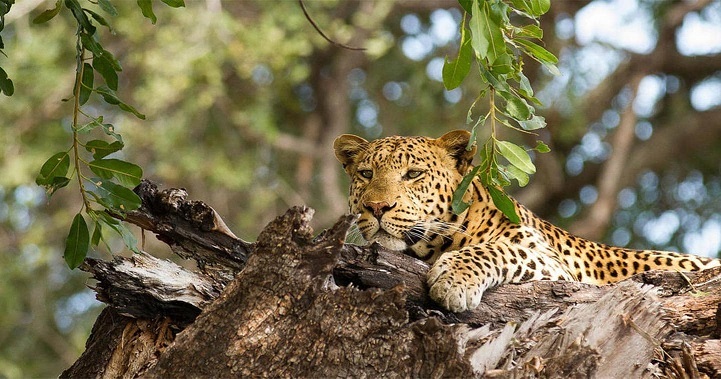 You will also see gemsbok, springbok, eland, blue wildebeest, cheetahs, wild dogs, jackals, bat-eared foxes and leopards. Birding is also excellent and of 297 species recorded, 96 are resident. It is difficult to get to Kgalagadi. From Gaborone, you drive for 860 km, of which 550 km is tarred and the rest gravel. Being a cross border park, you can also access it through South Africa. The park has no permanent tented campsites and on safari you must bring in everything you need. The dry season, especially between April and October, is the best time to visit Botswana on safari. It is then easy to spot wildlife gathered near water sources. The rains come over the southern summer months of November to March. 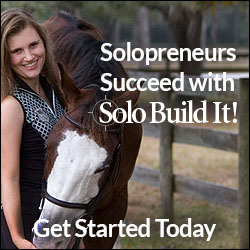 The roads are then difficult to use and with the abundance of water and pasture, the animals tend to scatter. Early morning and night temperatures in winter (May to August) can drop below freezing, especially in the southwest. But the days are then cool to warm. The summer experiences high daytime temperatures of up to 38°C. The cloud cover, though, and the rains tend to cool things a little bit. Beware that August is very dry and dust and sand storms tends to rise from the west. Remember to pack a pair of binoculars- they bring the animals closer without the usual risks. A pair of decent sunglasses is a good idea, especially if you travel to the Kalahari, where the glare can be somewhat unsettling. Also pack photographic and video equipment to record your safari for the sake of those of your unlucky friends who may not have been to Botswana. On safari, you are advised not to wear white or bright clothing to avoid exciting the animals. Light cottons and linens are adequate for summer. To survive winter mornings and evenings, you need warmer wraps and sweaters. Women should avoid wearing scanty beachwear in rural areas away from hotels and campsites to avoid offending locals.